Edit: 2 May 2015, after speaking to some blogger pals, I took some immediate action and decided on a few of these straight away! The latest updates are in italics! 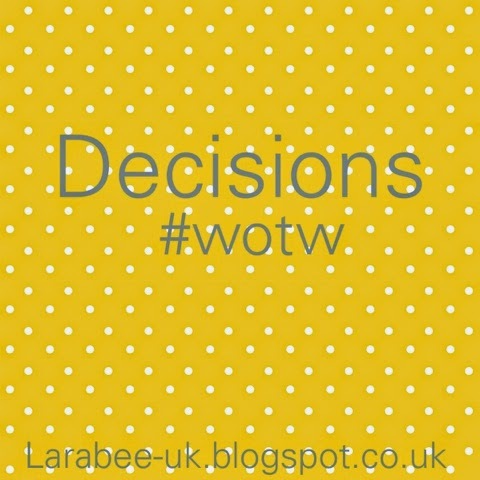 I've got so many decisions to make at the moment regarding my blog, taking it forward, my limitations and what I can do whilst working full time. 1. Should I move over to Wordpress? Yes, now just got to bite the bullet. 2. Should I buy a domain name? I did it! 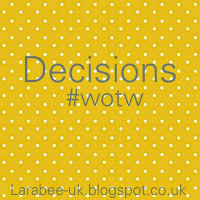 I now own www.larabeeuk.co.uk! 3. Should I scale down a bit because I'm struggling to keep up? 4. Can I up the pace and perhaps find a new more part time job? 5. Deciding on a new blog template for a makeover. 6. Deciding to turn down a couple of review opportunities. 7. Deciding to register with tots100. I did this one before the post went live. 8. Should I give up completely and use that effort to progress my career? Re-asses this on 1 Aug, can I find a way to maintain balance whilst doig both? 9. Deciding which old blog posts need re-working. 10. Deciding which old posts should be removed. For now these posts are part of LarabeeUK's history so for now they are staying. 11. Deciding whether to still write some out of date posts for future use. Yes, I'll be grateful this time next year, or the year after! 12. Deciding on a May blog plan. 13. Deciding to review my huge list of categories again. 15. Should I ditch my LarabeeUK Facebook page? 16. Should I use google analytics? Although it's a lot of thinking, I am feeling quite re-energised and enthusiastic towards blogging and the way forward, whichever way that will be. I hope you have all had a great week! Can't wait to catch up with everyone's words this week! I am constantly thinking like this, but I think you have to do what you feel is right, what you enjoy and also a bit of what is realistic. Good luck with your decisions. Thanks Jocelyn, although there's lots to do to get where I want to be, I'm trying not to overwhelm myself. When I first started, I didn't do the reviewing, promoting, linkies etc so it seemed a breeze, taking it more seriously really is a full time job! Aw thanks Jenny, it's definitely the way to go, I'm just not sure when I'll do it. Currently talking to someone who can do it for me quite reasonably. Lots still to think about. That's so frustrating isn't it? I'm concerned that my plans are going to cost me more self-hosted I could do everything I want to do in blogger but there are still loads of reasons to move, it's going to take me a while to work out my best option, but I'll get there. Thanks Leigh, I think it will be a long, slow process, but I'll get to where I want to be eventually, thanks for the info on wordpress, appreciate that! Thanks Laura, I think getting it all down helped and I convinced myself I wasn't going to give in without a fight! I've got lots of thinking to do but I'll get there eventually. Thanks Aby, saw your post this week too, it helped to know that people you think have it altogether still have concerns and challenges.